Hernia is defined as a protrusion of an organ through an abnormal opening in the wall of its containing cavity. Hernia genesis involves complex pattern of derangements including pathophysiological, biochemical and genetic derangements. It usually occurs in the groin though it can affect other areas of abdominal wall also. In simple terms, it is an unsightly bulge in the abdomen which appears when one stands or strains. It reduces on lying down spontaneously or is pushed in manually. It may be associated with mild discomfort, pain or dragging sensation. Irreducible hernia – the bulge of the hernia cannot be pushed back because of adhesions between the contents like intestines and the sac or pouch of hernia. Obstructed hernia – the herniated intestines develop obstruction due to blockage by food or due to adhesions. The abdomen becomes swollen, develops progressive pain and patient fails to pass stools or wind. Strangulation – due to tight hernia, the blood supply of the herniated intestines is blocked. This condition is very painful and can be life threatening. It requires emergency surgery. Conventional groin hernia surgery is done by open method in which a large incision is made and the prolene mesh is placed to reinforce the weakness in the abdominal wall. But it resulted in prolonged hospital stay, recurrences and pain. The minimally invasive or laparoscopic repair of the hernias was first reported in 1982. 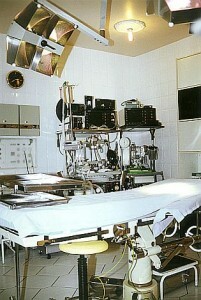 Since then the technique has been improved and most of the hernias can now be done laparoscopically. Laparoscopic access has advanced the art of hernia repair. The contents of the hernia like intestine or omentum is surgically reduces or replaced back into the abdominal cavity. Then an appropriate sized synthetic mesh is introduced into the abdominal cavity. This mesh covers the hernia defect and is fixed in place with surgical tackers. This repair prevents the protrusion of abdominal contents through the defect which is now blocked by the mesh. The laparoscopic repair is technically considered superior to the conventional open repair. It can be explained by a simple example. A hole in a bucket of water can be repaired by a patch which can be fixed inside or outside. The inner patch is held in place by the weight of water which pushes it against the bucket whereas the outer patch is forced away by the water. This makes the inner patch a stronger repair and the same principle is applied in the laparoscopic repair of hernias. Bilateral inguinal hernias, recurrent hernias, and unilateral hernias with a suspected contralateral hernia can be repaired without a large incision or multiple incisions. Contralateral inguinal, femoral or occult hernias can be examined and repaired. Surgical trauma to skin, subcutaneous tissue, fascia and muscle is reduced. Also, the spermatic cord is not dissected circumferentially, thereby avoiding the possibility of injury to testicular artery resulting in testicular atrophy. Hernias that recur after open procedures can be repaired laparoscopically without operating through scarred tissue of the previous procedure. The recovery of the patient is faster. It results in reduced postoperative pain and earlier return to work. It is an expensive procedure. The cost of disposables used in the surgery like the intraperitoneal mesh and the tackers is prohibitive. The learning curve of the surgeon is longer for the laparoscopic surgery than for the conventional surgery. The modern surgeon should be proficient in both laparoscopic and open repair techniques because in elderly patients with severe cardio-pulmonary, the hernia may have to be done by the conventional technique under local anaesthesia. Hernia can be asymptomatic or associated with dragging discomfort. It may also result in life threatening complications. If you have any abnormal bulge over your belly, consult it with your doctor. ← HIV and AIDS – what is the difference?